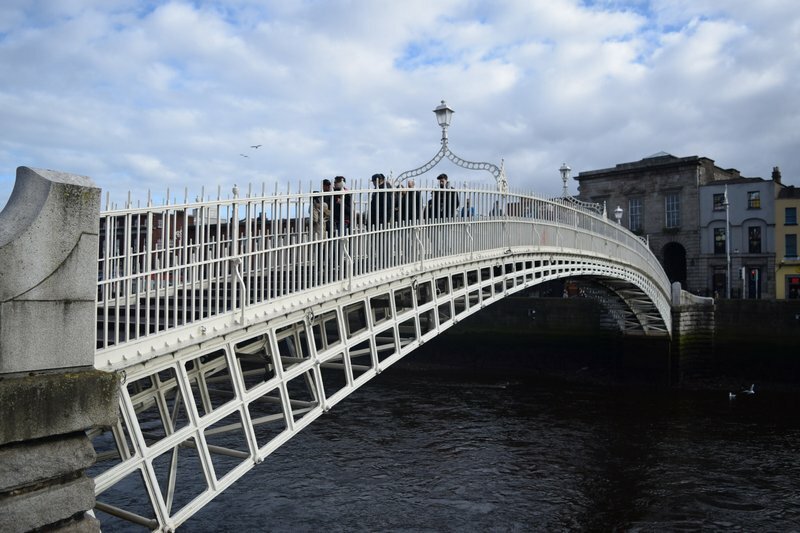 Dublin city centre has lots of great caches to not only keep you busy and explore various cache types, but to take you to some of the fascinating places the fair city has to offer. Starting right in the middle of it all on the main thoroughfare, O’Connell Street, Stiffy by the Liffey (GCE388) is a simple virtual cache highlighting the Spire, a 121 metre high pin-like structure commissioned as part of a street redesign in 1999. In December 2015, the spire was lit up like a lightsaber ahead of the release of the latest Star Wars movie. 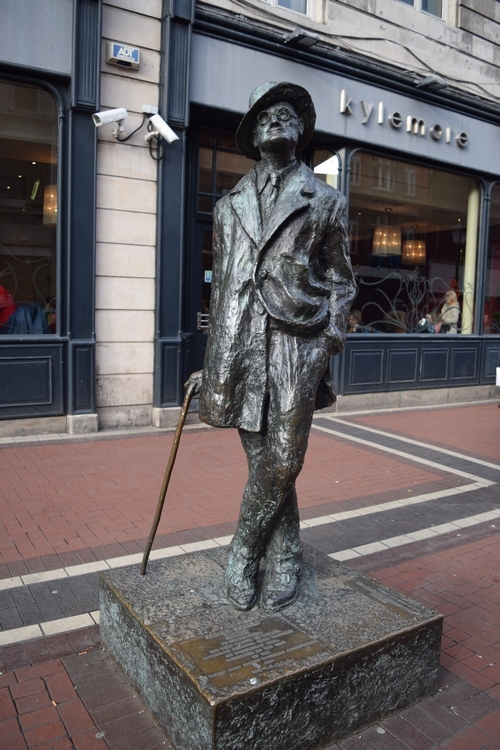 Heading down North Earl Street and Talbot Street, past the statue of James Joyce, you will reach Gardiner’s Treat (GCJKTN), the only webcam cache on the island of Ireland. A stroll towards the quays on the banks of the River Liffey and you will arrive at An Gorta Mór (The Great Famine) (GC4HQ60), my favourite multi cache in Dublin. 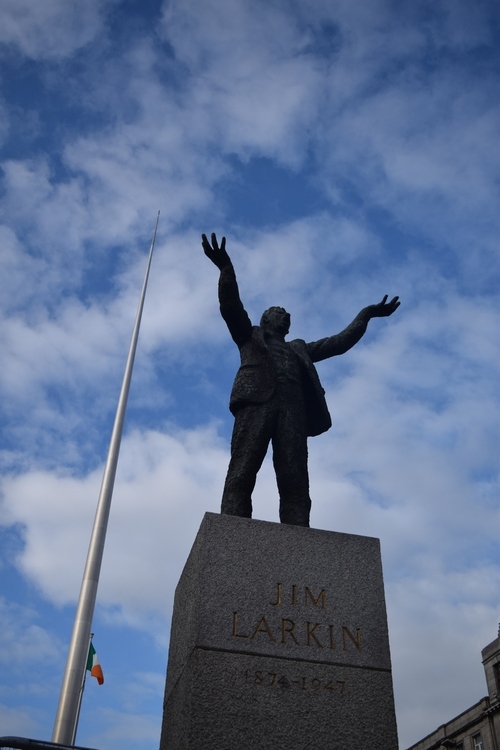 There are a number of fantastic multi caches in Dublin that highlight very interesting events in Dublin’s history, so it’s hard to choose just one but this one sticks out in my mind and I always recommend visitors to do it. As the name suggests, the cache highlights a dark time in Ireland’s history when a million Irish died and a million more emigrated to escape the ravages of the Irish Potato Famine. The short multi has two virtual stages and then the final. 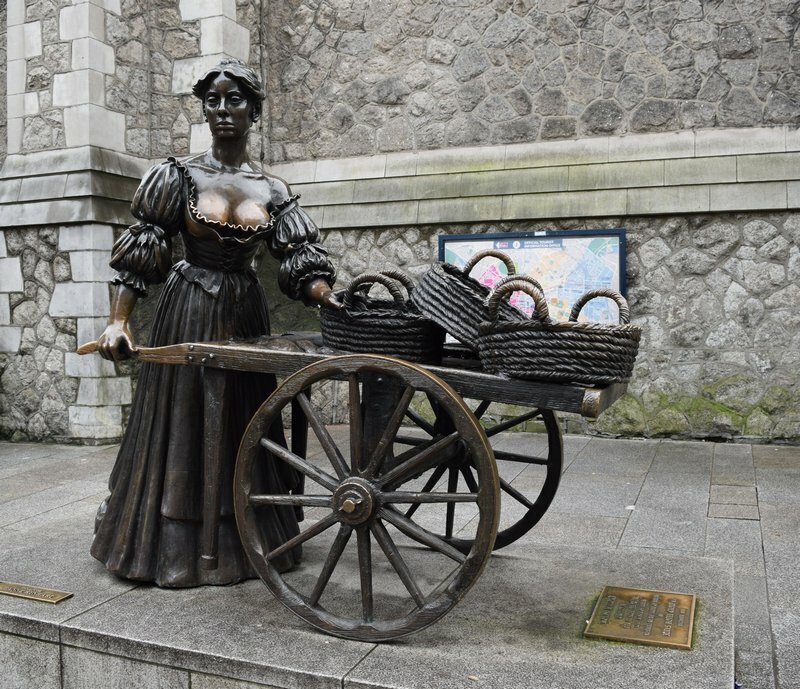 The first stage brings you to the haunting Famine sculpture by Dublin sculptor Rowan Gillespie. 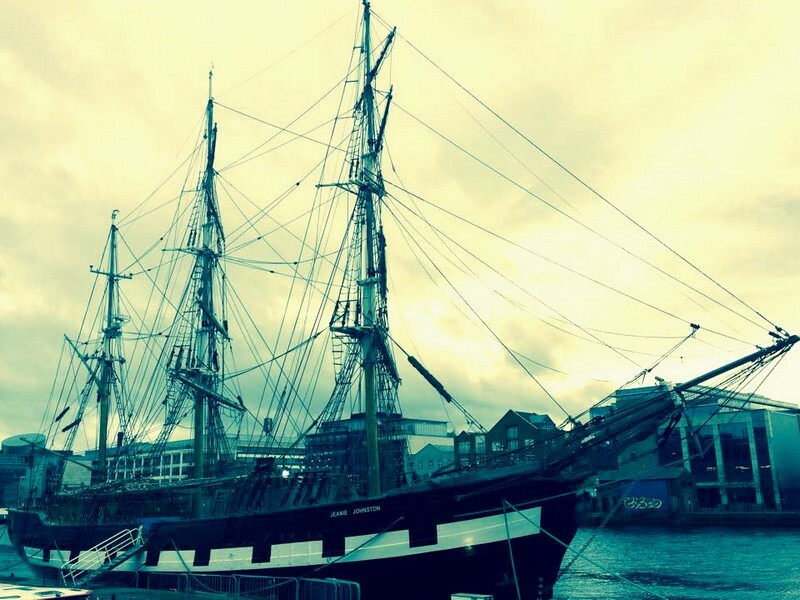 Stage two is at the Jeanie Johnston Tall Ship, a replica of the original Jeanie Johnston famine ship, which brought emigrants on the dangerous seven week journey from the west coast of Ireland to America. Not far from here is the EarthCache The Fossil Hotel (GC5VBCH) which focusses attention on the use of Irish limestone as a building material. The limestone is rich in fossils and this building is not the only one in Dublin to use the same type of stone. When you have studied the fossils here, you will find yourself noticing other places where they appear around the city. There are some great traditional caches to choose from in the centre. The most popular with tourists is The Guinness Logbook of Records (GC1JE8J), located beside the world famous Guinness brewery, just a short walk from the city centre. For somewhere to drop off your trackables, Magnetic Storage (GC3NH2Z), just north of O’Connell Street, is large enough to hold quite a few travel bugs and geocoins. If you haven’t had time to solve any puzzle caches before you arrive in Dublin, The Garden of Forking Paths (GC2P9XR) is a field puzzle located in the lesser known park, Iveagh Gardens. Most tourists will visit Saint Stephen’s Green in the city centre and the vast Phoenix Park just outside, so the Iveagh Gardens is usually less busy (unless it’s lunchtime on a sunny day, when workers from nearby offices decide to soak up the rays while eating their lunches). The green area dates back three hundred years but its current design is from 1865. The puzzle is different, but not too taxing on the brain and will nicely fit the bill for your ? icon. Heading back towards the river, staying on the south side, Chimney Park Wherigo (GC6AJHZ) will earn you a seventh cache type. Located in another hidden gem of a park, built on the site of the old Dublin Gasworks, the cache is only three months old but has already proved very popular. Last but not least, if you want to maximise your icon types, why not host an event, if there isn’t already an event happening during your stay. Dublin cachers are very social and enjoy nothing more than a cup of coffee and some geochat. If you’re looking for a location, Foam Café on Strand Street Great is a kooky location with hands down, the best banoffee cake you will taste in Dublin! The above are just a small selection of the fantastic caches to be found in Dublin. The city is ever popular with tourists and is renowned for being home to the friendliest locals you could ever meet. Topped off with some really nice caches, why not make Dublin the destination for your next geocaching trip? We look forward to welcoming you! Sarah is an avid geocacher based in Belfast, Northern Ireland. She writes a blog about her geocaching and travel adventures, called TheGeocachingJunkie.com.